Out of 17 indicators, 15 indicators show the 1st phase situation of the district within cluster A and 13 indicators in 1st phase within cluster B . Paddy production decrease this year but the wheat production during last cycle increased that contributed the HHs food stock. Market food stock is sufficient as per the demand due to smooth supply from across border of India. Income through cash crops like; vegetable, fish, mango as well as livestock products like; meat, meat, egg and fish shows normal situation. Income through remittance, seasonal migrants to cities and small enterprise are gradually increasing. Wage labor opportunities and income from returning people for festival also contributed the food security. Besides this, food consumption level for basic food is good. No significant cases of natural disaster, Human epidemic found that could make HH food insecure. Social security situation is also normal. But the district still found poor in Acute child malnutrition and market price of course rice and wheat flour also grown up. Even though, the indicators analysis shows the district situation for all 101 VDCs as Minimally Food Insecure. The prediction for next major winter crops like wheat, oilseed, pulse/lentine, vegetable is good. HHs food stock due to recently harvested paddy will be normal. Income through sale of Sugarcane, vegetable, meat, milk egg and fish as well as income through wage labor & remittance will increase the purchasing capacity of people. There will be similar sufficient food stock in key markets. The market price of key commodities will be also affordable. 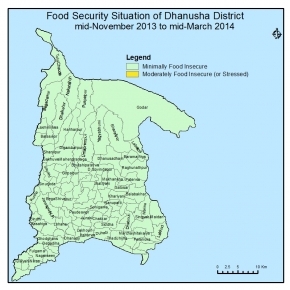 So district will minimally food insecure for the period through out the cluster A & B.